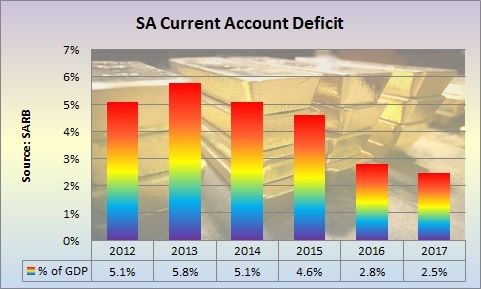 The South African current account deficit on the balance of payments narrowed to 2.5% of gross domestic product (GDP) from 2.8% in 2016, the South African Reserve Bank (SARB) said in its latest Quarterly Bulletin. On a quarterly basis however, the current account deficit widened to 2.9% of GDP in the fourth quarter from 2.1% in the third quarter as import growth outpaced export growth resulting in a narrowing in the trade surplus in goods. The import penetration ratio (real merchandise imports as a ratio of real gross domestic expenditure) increased to 26.8% in the fourth quarter from 25.4% in the third quarter. On a full year basis, the volume of total merchandise imports rose by 2.6% in 2017 after a 4.0% fall in 2016. 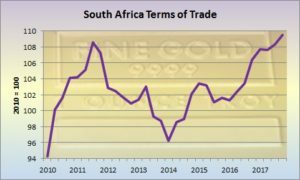 South Africa’s terms of trade improved further in the fourth quarter of 2017 as the rand price of exports, including gold, increased at a faster pace than that of imports. For 2017 as a whole, the terms of trade strengthened by 4.8% after only a 1.4% gain in 2016. The terms of trade are a measure of what a country gets for its exports relative to those of its imports. Terms of trade data are often recorded in an index so that economic monitoring can be performed and it is easy to draw conclusions relative to the base year. For example, one ounce of gold could buy 24 barrels of oil in the first quarter 2016, but now that same ounce of gold can buy 30 barrels of oil. The South African Reserve Bank (SARB) reported that the terms of trade rose to its best level since 2011 as it reached 109.5 in the fourth quarter 2017 from 101.3 in the first quarter 2016. This means that relative to the base year of 2010, South Africa received 9.5% more import volumes for the same amount of exports. This improvement is also reflected in the exchange rate as South Africa gets more US dollars for the same volume of exports. This is one of the reasons why the rand is so strong currently. A stronger rand means South Africa has to pay less for imports, so the price of imported commodities such as oil comes down. Lower inflation then boosts the spending power of consumers, which results in a boost to economic growth. Lower inflation can also prompt the SARB to cut interest rates, which will help consumers to repay their debt faster. The nominal effective exchange rate of the rand (NEER) increased, on balance, by 8.3% in the fourth quarter of 2017 compared with a decline of 4.6% in the third quarter. The fourth quarter rise in the NEER was the largest quarterly jump since the second quarter of 2009. The NEER declined by 3.4% in October 2017, followed by increases of 2.0% and 9.9% in November and December respectively. The December 2017 increase was the largest monthly increase since April 2009. The shortfall on the services, income and current transfer account widened by 11.0% in the fourth quarter of 2017 causing the deficit as a percentage of GDP to increase to 4.4% in the fourth quarter from 4.1% in the third quarter. On a full year basis, the deficit on the services, income and current transfer account relative to GDP increased to 3.9% in 2017 from 3.6% in 2016. Gross dividend payments to non-residents contracted by 2.4% for 2017 as weak South African economic growth impeded dividend payments. This was the second consecutive annual decline in gross dividend payments since the global financial crisis of 2008/9. Similar to dividend payments, 2017 also marked the second consecutive annual decline in dividend receipts. The increase in net payments for services was moderated by a second consecutive quarterly increase in gross travel receipts. 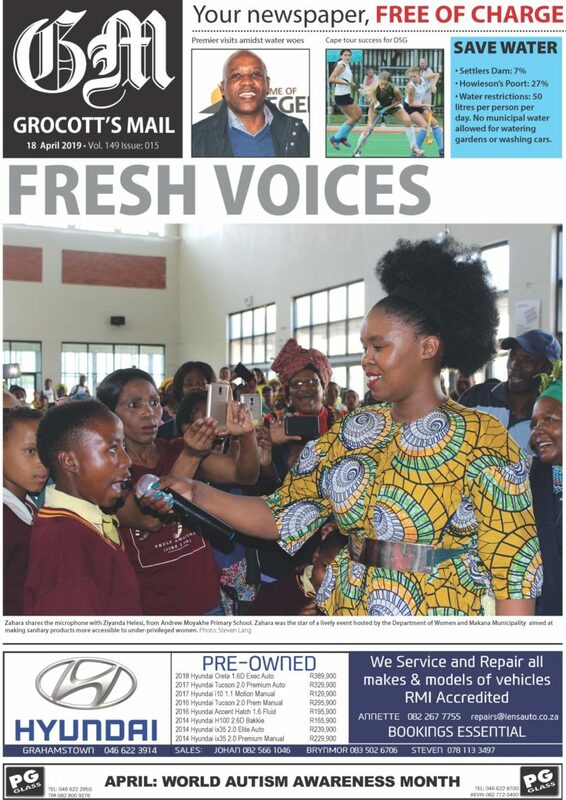 However, gross travel receipts improved by only 1.0% for 2017 as a whole, compared with an increase of almost 11% in 2016, as xenophobia, the strong rand and Day Zero headlines have slowed tourism growth to only 2.4% in 2017 from 12.8% in 2016. The slower growth in tourism receipts in 2017 was affected by the significant strengthening in the external value of the rand against major currencies on an annual average basis, for the first time since 2010. A noticeable increase in net current transfers contributed to a widening of the deficit on the services, income and current transfer account in 2017. This was largely due to a marked increase in the amount paid to South Africa’s trading-partner countries in the Southern African Customs Union (SACU) in the 2017/18 fiscal year, but this is set to decline going forward. 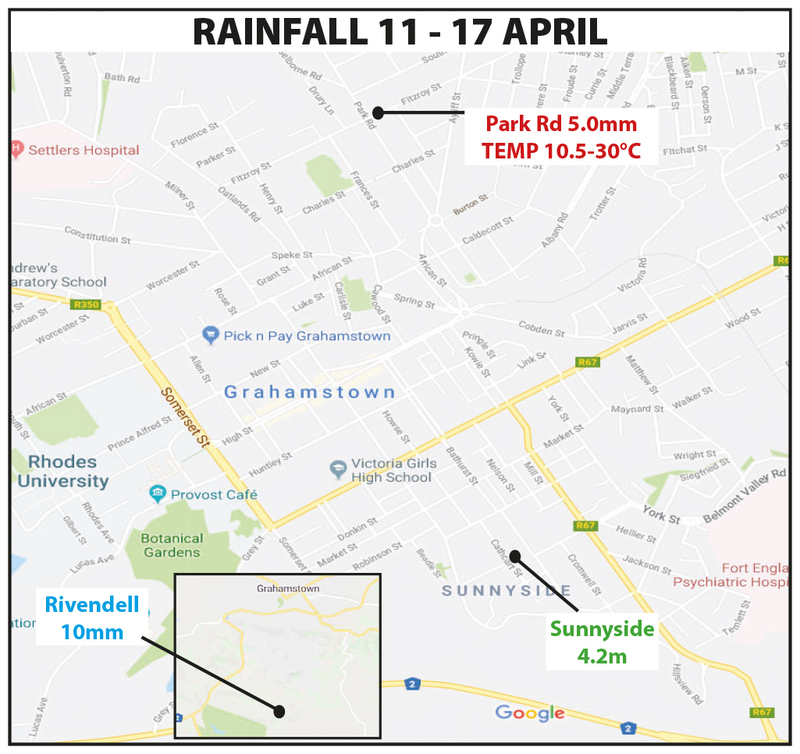 The cumulative inflows on the financial account amounted to R101.1 billion in 2017 compared with R131.4 billion in 2016 or 2.2% of GDP in 2017 from 3.0% in 2016. Inward direct investment slowed to R17.7 billion in 2017 from R32.9 billion in 2016. Non-resident investors almost doubled their net purchases of South African debt and equity securities to R278.8 billion in 2017 from R139.9 billion in 2016. Other investment liability inflows grew by R60.6 billion in 2017 compared with an outflow of R3.8 billion in 2016. For 2017 as a whole, the country’s international reserves increased by R25.5 billion, but this was less than the R40.2 billion increase in 2016.